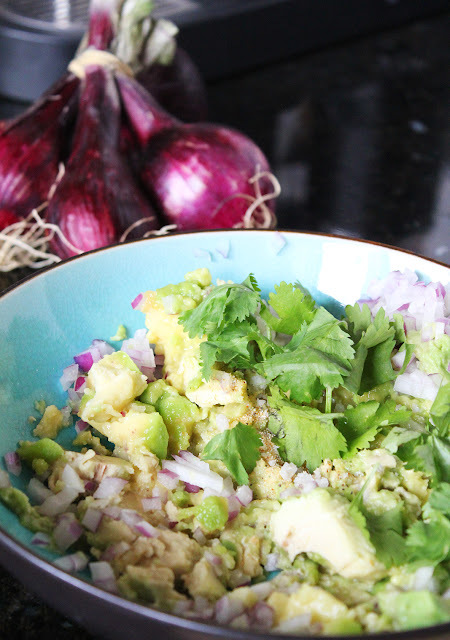 Guacamole is literally one of our favorite snack foods - the creamy mix of avocado with the sour of the lime, the savory onions and garlic, the freshness of the cilantro just seems to go so well together. And whether served by itself with tortilla chips or as an accompaniment, the flavor is just excellent. I think the only reason people don't make it from scratch so often is because it seems like a complicated food to make but really it's quite easy and quick. Dice the onion finely and put into a bowl. Smash and chop the garlic and add. 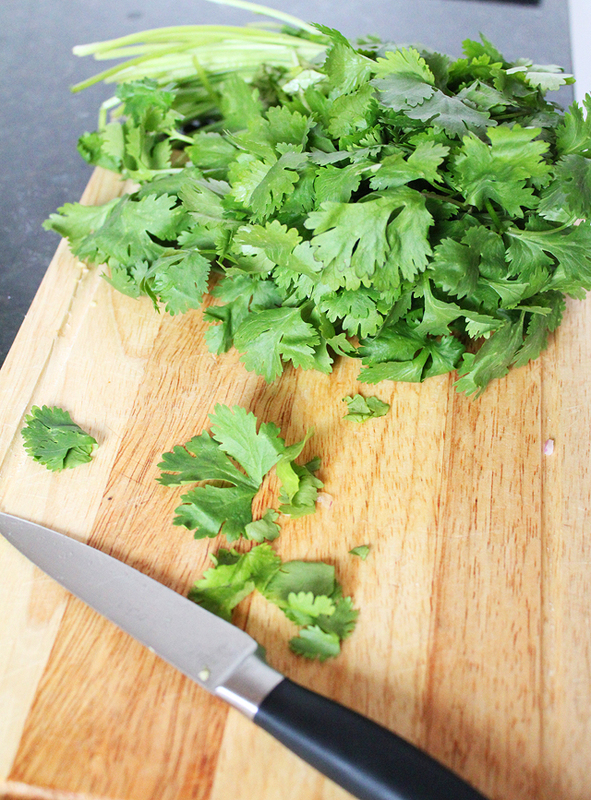 Wash and roughly chop the cilantro (or if you prefer, leave the leaves whole). Peel and pit the avocado and add to the bowl. Using a fork or masher, simultaneously mash and mix the ingredients. Squeeze half of the lime juice in and a dash of salt. Blend well with the fork and taste. Add more lime juice and salt as needed. Jen doesn't like spicy food at all, so we don't add anything hot but this can obviously be made spicier. Also, we prefer it chunky but if you like smoother, just keep mashing until you reach the consistency. A mortar and pestle also work well. *Note: This time of year, most of the avocados we get in NYC are Florida which are lighter in color and taste a bit milder. I prefer to use good California Hass (early summer) or Fuerte (winter) when they are ripe. If you can only get unripened ones, leave them in a paper bag at room temperature until they are just right. Guacamole is our favorite snack, too. I use green onion, lemon juice and garlic powder in mine, but otherwise it's the same easy drill! 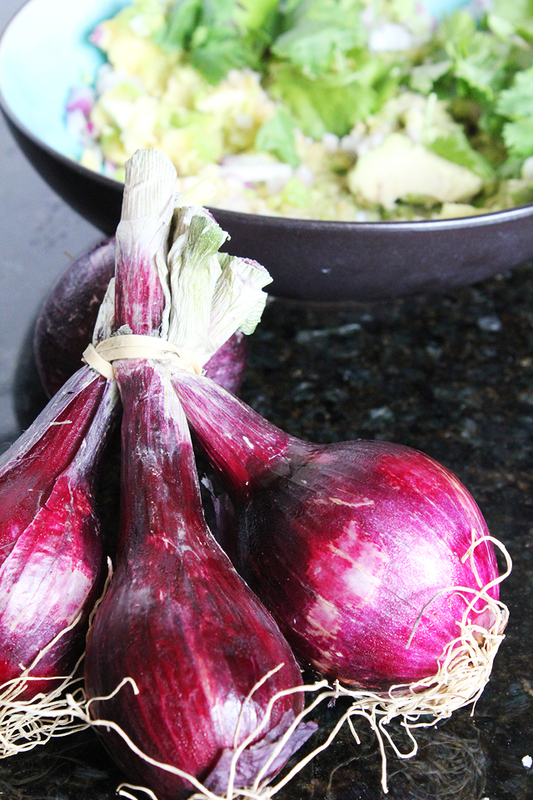 I like to use green onion (scallion) as well though I prefer red onion because it's a little sweeter. Garlic powder is great to save the hassle of fresh garlic - good point!